Pixel art of NO Body's character by him/herself. NO Body (known by most MFGGers as a god of spriting) is an MFGGer has rather phenomenal knack for creating sheet-after-sheet with 'lickity speed' in many various styles. He's most known for his many works in the General Friendliness topic and constantly has people requesting sprites from him, though he has been known not to take requests..
NO Body himself doesn't think his skill is any good at all; he blames his low self-esteem. NO Body is also the creator of the MFGG Battle Sprites or "NO Body Battle sprites", as he calls them himself. The sheets are small platform sprites of MFGGers that can be used for many things, but they are mostly used for fighting hoaxes & games. Many members made them into a avatar fad, but NO Body calls them his private project and not a fad. NO Body has sprited lots of soveryhappy sprite sheets (as well as many other emoticon sprite sheets), although he claims NOT to be a fan of soveryhappy. NO Body have take his first attempt spriting YI styled sprites but ends up his own style. Soon after he decided them as Pesky Plumber styled sprites. NO Body's character is a little black dragon he made long ago, even before his time on the Internet. The character has changed over time but has always been a dragon or reptile. However, MFGG has never seen any of the previous versions, but it's said he used to have red eyes. 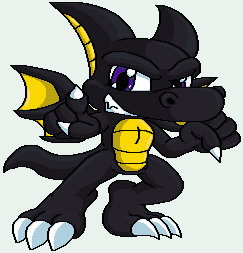 The character NO Body (which actually stand for the fact that he's got no name) is a small male dragon, cute but very EVIL, and not much more is known, and he does NOT share the same personality as his creator - they are very different in fact. NO Body is quite overprotective over his/her character however, and strongly dislikes when people use him the wrong way. Upon joining MFGG, NO Body used another of his characters called BAD CAT. Many people thought this was NO Body's true character, and got disappointed when he changed it. There has been lots of confusion with NO Body's true gender. Some think she's a girl, others think he's a guy. NO Body himself always avoid the question if asked directly, but has only stated that he/she is the LEAST likely of the two. Personally NO Body wants people to shut up about it & leave him/her alone. Today it is generally believed that NO Body is male. Currently NO Body has a small grudge against some of the forum, seeing as he worked very hard and long to finish the MFGG Battle Sprites project (over a year and a half in fact). Also making NO Body one of the very few MFGGers to actually finish an MFGG-related project, but has yet to get anything back for all the hard work. And calls the forumers "ungrateful" though never directed at anyone (various people have tried to make a game out of the sprites, but have always ended up unfinished/canned). Despite this grudge, NO Body has always been very found of the admins/mods/staff, and mostly shows them respect. After the MFGG sprites, NO Body found the Mushroom Kingdom Fusion game project and started making sprites for the game. Now he's part of the Dev team, and dedicates his full sprite time to the project where people actually appreciate his work. He hardly comes online on MFGG much at all, other then to check the "Notes." NO Body has actually been thinking of leaving the forum altogether, although he still submits a sprite to the mainsite once in a blue moon.